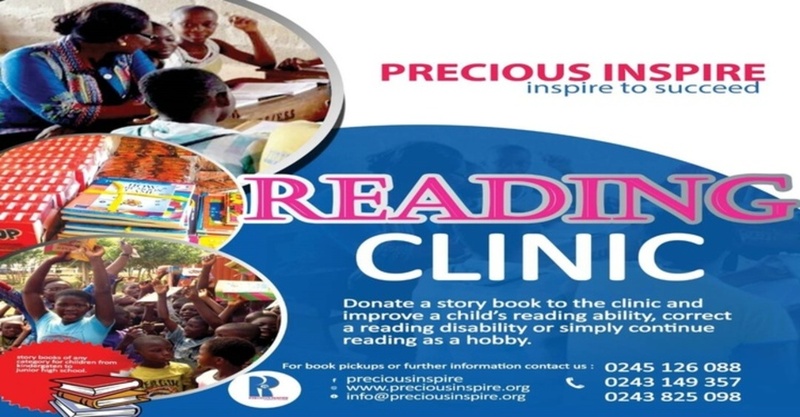 CONCEPT DESCRIPTION OF THE READING CLINIC PROJECT UNDER PRECIOUS INSPIRE ORGANIZATION MISSION The reading clinic Project under Precious Inspire works to create a culture of reading for children by providing inspiring books and literacy programs across Ghana, especially for children in the rural areas. VISION All children will have access to quality story books and motivation from volunteers no matter their economic status and capabilities. Background Problem Statement Reading in everyday life situation is paramount to all school going age irrespective of their family background, class or programme of study. Reading is a key to success at all levels of education and its significance in many arrears of life and academic achievements can never be overemphasized. Reading is the only tool for success in all academic industries. Reading goes along with writing at all instances in life. It is therefore prudent to practice reading every day because reading is contrary to being an innate habit, is a skill which is honed to perfection through constant practice. In other words, you have to go beyond merely wishing you could read which would enable you gather meaning of the printed page with the least effort and within the shortest possible time, N.J Opoku Agyemang (1998) The falling standard of education in Ghana and Africa as a continent emanates from lack of effective reading habit, perhaps public schools. There is no clear evidence which proves that there are insufficient reading materials available for Ghanaian children to read. Ghana has got libraries well stocked of books in all the regions but one could just envisage the number of public basic school pupils who make time to read a page of a book a day. There is an evidence that Ghanaians have apathy towards reading which could be ascribed to a total negligence of the basic school curriculum to match pupils’ reading aspirations. Though teachers in basic schools treat reading comprehension with their pupils in class, they do not promote reading. Hardly do teachers treat reading as a major topic in class. Pupils depend solely on their comprehension textbooks for reading; hence they hardly read novels, dramas or poem for leisure purposes. According to EGRA 2013, where a test was administered nationally in English to 7,923 pupils in schools across Ghana. Based on the results of the oral passage reading and reading comprehension sub tasks, the following results were deduced • Cannot read: oral reading fluency (ORF) score is zero • Read some words, but not understand: ORF score is greater than zero and reading comprehension score is below 60% correct of those attempted • Read with some understanding: reading comprehension score is 60% of those attempted • Read fluently and understand: reading comprehension score is 80% correct of total With all the above premise, reading needs to be redesigned in order to enhance an extensive reading aspirations .This is what has brought into being Project inspire which seeks to organize reading clinics and to inspire basic school children to succeed by developing a reading culture which can be assimilated rather than making it a priority. Objectives The objectives of the Reading Clinic are; a. To inculcate in children the culture of reading for pleasure and at their leisure time. b. To inspire children to succeed through reading and to raise the standards of behavior ,reading and learning of basic school pupils in Ghana c.	To make reading and learning fun and an enjoyable experience for all basic school pupils. d.	To provide a unique and useful atmosphere that encourages and promotes the better use of leisure times often available to Children, the Youth and the Less privileged in our societies and our world towards their self-development and enhancement. e.	To encourage the spirit of volunteerism among the youths. Story books for children between the ages of 4 years and 18 years.This story books will aid reading at project sites and also afford each child get at least one storybook to read at home. materials (such as paper, pens, crayons,colour pencils and ink) for writing and drawing.This will help the children to review what ever book they have read. A mission to bring digital books to every child as well as bring technology to the doorsteps of the children.The e-readers will aid ,motivate and improve their reading. Snacks including biscuits and drinks.This will help sustain the interest of the children during each reading clinic.